Beetlejuice, Beetlejuice, Beetle. . . Wait! Let's think about this for a second. If we finish this chant are we going to be able to handle what's about to happen next? Sure, the legendary ghoul might intensely disturb your roommates but wouldn't it be fun to unleash a little chaos in your life? Maybe you don't need to unearth the intensely creepy fellow to experience the macabre pandemonium that he can release. 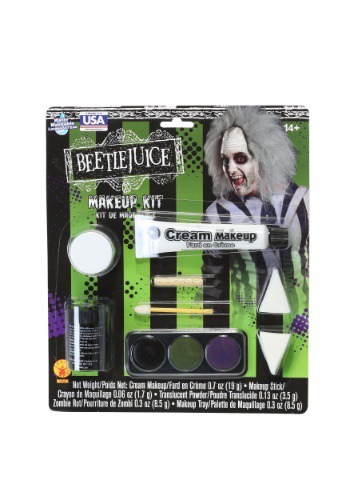 Perhaps you'll be able to feel that sinister sensation simply by dressing up as the nightmarish Beetlejuice. Wait? Just because we said it a third time that doesn't mean we finish the mantra, right? You can don a striped suit, you can rock that wild hair but if you aren't fixing up that deathly pallor then you aren't going to take the look to its full potential. This makeup will make you look like you're fresh from the grave with a white base, black accents, and green and purple accent colors. You'll also receive blending sponges and a detail blending stick. So, put on the makeup, turn on the juice, and see what shakes loose.